L.A. signs the former Hiroshima Carp star, despite reported issues over his pitching arm. 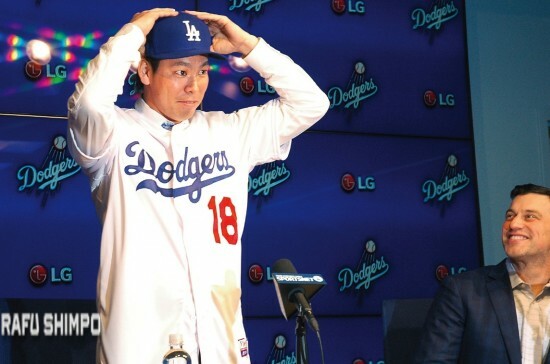 Kenta Maeda tries on his new cap during a press conference Thursday at Dodger Stadium, as Dodger President of Baseball Operations Andrew Friedman looks on. If Kenta Maeda’s first impression on the Dodgers included concern during his physical, he tried to right the ship straight away in his first press conference. The 27-year-old now former Hiroshima Carp star addressed a jam-packed conference room in English on Thursday, before anyone had a chance to lob a question at him. “Hi, my name is Kenta Maeda. I came from the Hiroshima Carp and I am very honored to be on the Dodgers,” he said with a deliberate politeness. With Kenta Maeda, Dodgers manager Dave Roberts has a potent right arm to complement a wealth of lefties, including ace Clayton Kershaw. The Dodgers have reportedly offered Maeda a contract that guarantees him $25 million and includes incentives that could top $100 million over the deal’s eight years. The contract is also the longest ever offered to a Dodgers pitcher. The contract is in addition to the expected $20 million posting fee L.A. will have to shell out to the Carp. Maeda declined to make any comment about reported problems discovered in his right elbow, saying he has no doubts about his condition, adding that he expects to reach the 200-innings-pitched mark this coming season. Maeda repeatedly expressed gratitude toward the Dodgers for having faith in his abilities, especially given the results of the exam. “Although there were some irregularities found during my physical, the Dodgers have made the decision to make a long-term commitment to me, and that was meaningful to me,” he said. 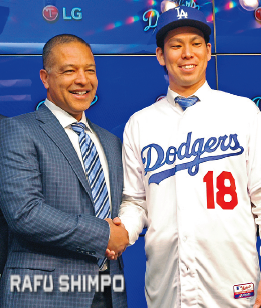 Maeda will be the eighth Japanese-born player in the Dodgers’ history, following the likes of Hideo Nomo, Takashi Saito, new manager Dave Roberts, and former Dodger and current Carp starter Hiroki Kuroda. Maeda said he discussed his move to L.A. with Kuroda and that his only concern will be pitching in a five-man rotation, a shorter turnaround than the customary once weekly in Japan. Kuroda told The Los Angeles Times that Maeda has a skilled feel for pitching and that he’ll do well once he adjusts to working on four days’ rest. After the press conference, Kenta Maeda gave his first official autograph as a Dodger, to young fan Presley Roa. Roberts now has a potent right arm to add to a revamped pitching rotation, one that has added Scott Kazmir to join Clayton Kershaw and Hyun-jin Ryu, all left-handers. The Dodgers backed out of a deal to sign another lefty, Hisashi Iwakuma, after red flags arose during his physical. In eight professional seasons with Hiroshima (2008-15), Maeda compiled a 97-67 record with a 2.39 ERA in 218 games, including 28 complete games and 10 shutouts. During the course of his career, Maeda has posted a 1.05 WHIP and a 3.87 strikeout-to-walk ratio, while allowing an average of only 0.6 home runs per nine innings. Maeda has also been one of the top fielding pitchers in Japan, earning recognition as the best fielding pitcher in Nippon Professional Baseball five times in the past six seasons. A two-time winner of the Sawamura Award as Japan’s most impressive starting pitcher, Maeda is known for a particularly effective slider. He said he’ll need to adjust the slightly different ball used in the majors, but that he’s had some experience with it during the World Baseball Classic. “In the 2013 WBC, I pitched on Major League mounds with a Major League ball, so I have that experience and I am not concerned,” he said, adding that the experience also helped his family get a taste of life in the States.